While my (somewhat) equals hop into re-done cars with muscle-top apes, I retreat to my favourite shops and market in the more quiet extremes of town. Bruce’s country market down by the riverside sits on the skirt fringe of my small enough gem-of-a-town Maple Ridge. It’s also my salmon place. Yes, I’m a B. C. girl and I love my salmon, but only wild sockeyes please. The farmed, beastly humongous monster fish of the Atlantic are practically lumps of hormone- and antibiotic-injected flesh anyway. You may have noticed that I’m starting to clean up my blog, starting from the last post https://cocoetcocoa.wordpress.com/2013/06/15/casually-pudding-it-out/ in terms of style and image. Yes, and I’m not just starting now, with only what meets the eye. People, eat clean, eat less. That way you get the best ingredients, and don’t actually spend a dollar more. This is particularly true with proteins. These days, it seems the mot du jour is always along the lines of sustainability. Hello, does buying so-called “sustainably sourced fish” in such large quantities that the following year you still find the carcass of an animal skinned and filleted twelve moons ago represent sustainable? Does cooking so much “free-range organic” ground beef into a tub of meat sauce then letting the leftovers (which is half that tub) stink and rot environmentally conscious? I’m not saying that we should live as monks or saints. But I do find that moderation is a rather valuable trait, it will actually save you legitimate bucks. So what does all this have to do with the plat du jour? Well, you don’t need a whole fillet to serve two. You just need 200 g of really good quality salmon. 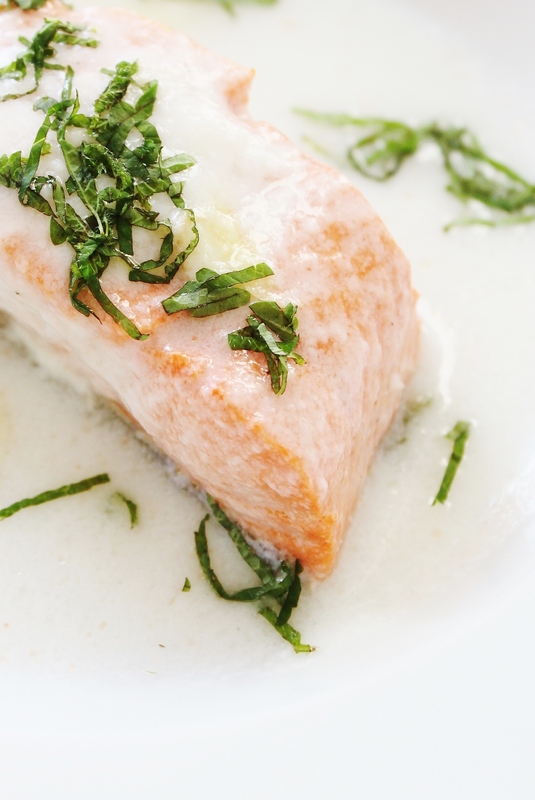 To make the poached salmon, bring the coconut milk and ginger to the boil in a small saucepan. Stir in the lemon balm, fish sauce, and sea salt. Remove the pan from the heat and gently lower in the salmon fillets, skin side facing down. Cover and return the pan to barely a simmer for 6 minutes; you can cook it slightly longer, but I would not exceed 8 minutes. Add the sesame oil at the last minute. Lift the salmon with a slotted spoon onto warm serving plates. To make the sauce, strain the poaching liquid and froth it up using an immersion blender. Spoon the sauce over the salmon and garnish with more lemon balm. Serve immediately. Also, this makes plenty of sauce, which implies that you could double the amount of salmon to serve four people or mop it up with some french crusty bread. I would just throw some glass noodles and bok choi into the poaching liquid to make it a meal, though. Great recipe and wonderful statement – less is more. Thanks Claudia, it’s nice to know that this perspective isn’t going extinct!